New series of licensed premium puzzles featuring Sonic The Hedgehog and Teenage Mutant Ninja Turtles, illustrated by fan-favorite artists. San Diego, (June 26th, 2018) IDW Games is excited to announce its new line of licensed jigsaw puzzles for the holiday season featuring artwork from fan-favorite artists. These 1000-piece puzzles are manufactured in the USA from 100% recycled materials and built for puzzle hobbyists and fans alike. The first two puzzles in the IDW Games line will be Sonic The Hedgehog and Teenage Mutant Ninja Turtles, both slated for release in September 2018. Sonic The Hedgehog: Too Slow! Premium Puzzle features artwork from Sonic the Hedgehog animator and comic artist Tyson Hesse. 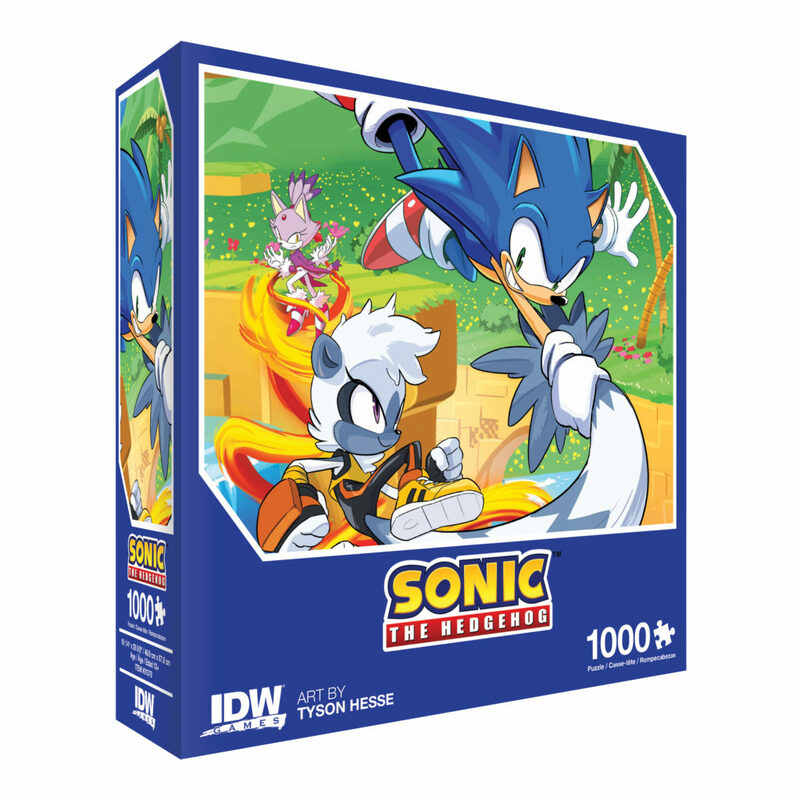 The 1000-piece puzzle includes Sonic, Blaze, and Tangle, an all-new character from IDW Publishing’s new comic line. 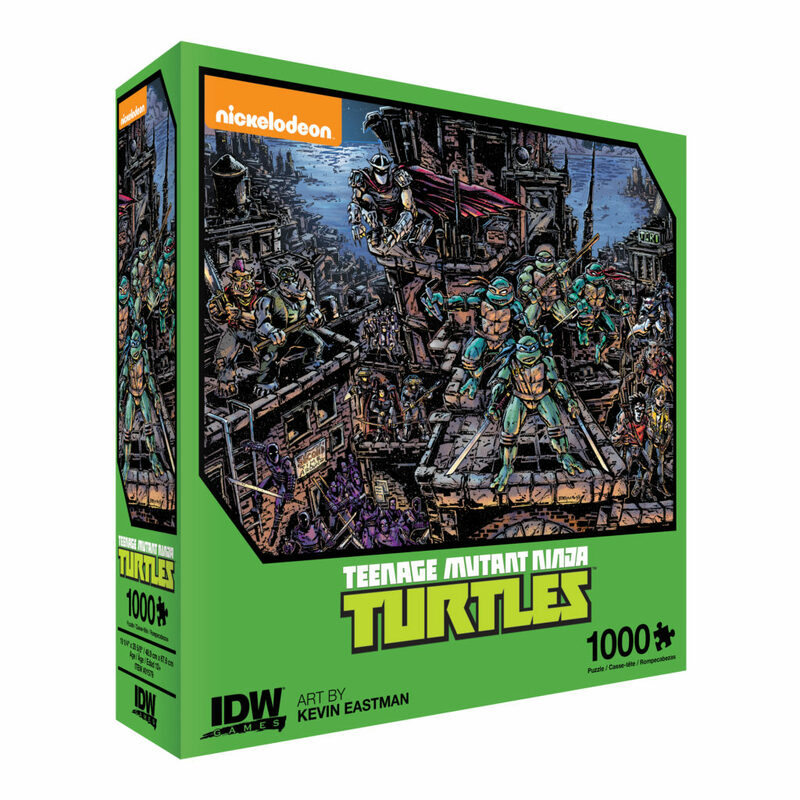 Teenage Mutant Ninja Turtles Universe Premium Puzzle features artwork from Teenage Mutant Ninja Turtles co-creator Kevin Eastman. This challenging puzzle includes your favorite Turtles along their friends and foes. Both of these collector jigsaw puzzles will be available in retail stores September 5th 2018. IDW Publishing’s comic book and graphic novel catalog includes some of the world’s most popular entertainment brands, including Transformers, My Little Pony, Star Trek, Teenage Mutant Ninja Turtles, Ghostbusters, and Disney’s classic characters. At IDW’s core is its commitment to creator-owned comics including 30 Days of Night, Locke & Key, Wormwood, Ragnarök, V-Wars, and Archangel by bestselling sci-fi author William Gibson. IDW Publishing is also home to the acclaimed and award-winning imprints; Top Shelf, The Library of American Comics, Yoe! Books, and Artist Editions, showcasing the greatest original art ever published in American comic books. IDW Games’ diverse line-up includes the international phenomenon Machi Koro, as well as hit licensed games such as X-Files, Dragonball Z, Atari Series, and TMNT. ← Nickelodeon’s Splat Attack! Is LIVE On Kickstarter!